The perfect wedding venue, corporate retreat or large family vacation. Air conditioned movie theater, games/snooker room, kiddies play room and fully fenced swimming pool. Iro Luxury Retreat offers a secluded haven of relaxation and privacy. The Retreat is self-catering with the options to have an in house chef, massage therapy and daily room servicing. 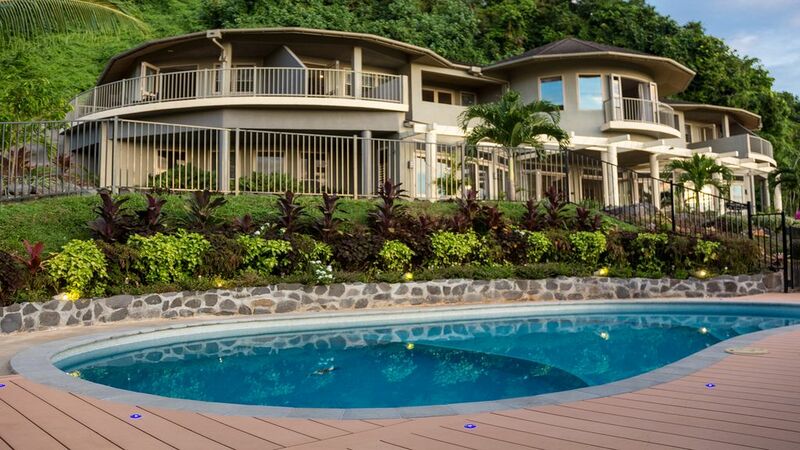 It is perched high in the hills of Ruaau Arorangi and has panoramic ocean views. Upstairs, we offer 2 family rooms (2 separate rooms in each), 2 double rooms, 2 twin rooms and a master suite each with their own en suite. Our ground floor bedroom does not have an en suite. The home features a large open plan living area with a fully equipped kitchen, an air conditioned movie theatre and a games room which are perfect for entertaining large groups of all ages. There is also a kiddies play room with a television, dvd player and an assortment of toys. The large open plan living area flows outside to a fully fenced swimming pool & expansive deck with BBQ. Our focus is to cater for the needs of large groups. Perfect for corporate retreats or large family celebrations and it is the ideal wedding venue. The deck holds a purpose built cabana to cater for functions and receptions for up to 85 people. Iro Luxury Retreat is like your own private hotel accommodation where you can unwind, relax and settle into our little corner of paradise. All en suites have showers only except the master bedroom which has a spa bath and shower. There is a common downstairs toilet and common bathroom /toilet upstairs also. There is a shower rose next to the pool to rinse off (cold water only). A venue hire fee of $20 per person will apply for the use of the deck for functions such as wedding receptions, birthdays - excluding the guests staying at the premises. Eg: if 20 guests are staying at the house and 20 extra people attend a function, there will be a venue hire fee of $400. Ask us about using a private chef for meals during your stay.